Growing up in Regina, Saskatchewan, there were lots of opportunities for Kamloops Blazers center JC Lipon to play different sports. Of course there's hockey. And there was his other passion -- wakeboarding. Yes, growing up in the middle of the Canadian prairies, Lipon amazingly grew into an accomplished wakeboarder, and took part in national and international tournaments. "I've been across Canada for competitions," Lipon told NHL.com. "I've been to Reno for Worlds. I used to travel to Florida for months at a time to train." The only water he competes on now is the frozen kind, and that's working out just as well for him. There's little question that the best team in the Canadian Hockey League right now is the Kamloops Blazers. Of the 60 teams playing in the Quebec Major Junior Hockey League, Ontario Hockey League and Western Hockey League, they're the only one without a regulation loss. 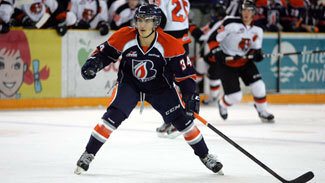 The Blazers are 12-0-1, with their only setback coming in their third game, a 4-3 shootout loss at the Victoria Royals. They're 5-0 at home, 7-0-1 on the road, and just came off a five-game trip through Alberta that saw them average 5.0 goals per game. Besides having a five-point lead on the closest competition in the WHL, the Blazers are No. 1 in BMO/CHL MasterCard Top 10. Four of the top seven scorers in the WHL play for the Blazers -- led by forward JC Lipon, who leads the league in goals (13) and points (32) and is tied for the league lead with 19 assists. Not only does Kamloops lead the WHL in goals scored (61), they've allowed the second-fewest (30). Since winning three Memorial Cups in a four-season span between 1991 and 1995, Kamloops has lost in the first round of the WHL playoffs 12 times in the past 17 seasons, missed the playoffs twice and been to the WHL final just once. However, last season's team pushed the talented Portland Winterhawks to seven games in the semifinals, and much of that team returned to spark the fast start this season. "Last year we had a run in the playoffs," Lipon told NHL.com. "This year bringing in some young guys, they're playing on a winning team and losing is not an option." Coach Guy Charron, who arrived during the 2009-10 season, said the seeds for this season's start were planted last season. "What we did last year was a big turnaround for us and I think created confidence within the team," he told NHL.com. "We created our own identity here right now and the kids believe in it and they want to continue that. Hopefully bring back what the Blazers are all about in the '90s, what they were and what kind of team they were. The kids are on a mission. They feel good about themselves. We have really good kids. They're responding. They believe in the identity we're trying to create as a team. They believe that's the way we need to play to be successful." Charron said he's also been impressed by his team's resiliency. The team has won five one-goal games and came from behind in three of its wins. "There have been games where I thought, well, here's our first loss, here's our first loss," he said. "All of a sudden they pull it off. They find a way. That's a credit to them. They don't count themselves out of anything. They're going to go right to the last buzzer." The 19-year-old forward is off to a blistering start, leading the Western Hockey League in goals (13) and points (32), and tying for the league lead in assists (19) in 13 games. Passed over in the 2012 NHL Draft after he totaled 19 goals and 65 points in 63 games, it's doubtful teams pass on him again in 2013. "This kid has just exploded out of the gate," NHL Central Scouting's Peter Sullivan told NHL.com. "Here's a kid that in his [initial] draft year wasn't drafted, and guys that were drafted in the first two rounds [last year], he's better now at this point than the kids that were drafted." Lipon almost went down a different path than hockey. He split his time -- hockey in the winter, wakeboarding in the summer -- and said picking ice over the waves wasn't an easy choice. Growing up, he would spend nearly every day in the summer on Echo Lake, about an hour drive away, working on tricks and training for competitions. He also would spend parts of his summer in the Orlando, Fla., area, training with professional wakeboarders. "In the summer it was wakeboarding, in the winter it was hockey," Lipon said. "[My parents] liked me getting away. And I also met a lot of cool people down there." Passed over in the WHL draft, he got a tryout with the Blazers in 2009 then had to make a choice. "When I was 16 I came here and … I was coming here to see what it was like," Lipon said. "I had flights to nationals but I ended up staying. It was a big decision." Right now it appears to be a smart one. It didn't happen overnight, but now in his fourth WHL season, he's starting to blossom. "I think because of his summer sport that he was so successful, he felt that perhaps with hockey it would come the same way, in the same fashion," Kamloops coach Guy Charron told NHL.com. "He worked his way through it and he did that as a 17- and 18-year old, and now he's blooming because he's a great athlete." At first glance there doesn't seem to be much similarity between hockey and wakeboarding, but Lipon said some of the skills that served him well on the lake have helped him on the ice. "Actually there's a lot of similar things," he said. "Balance in wakeboarding is huge when you're executing air maneuvers. There's lots of different muscles you use. I think it helps me a lot." What also has helped has been consistent linemates -- he's skated at right wing on a line centered by Colin Smith with Tim Bozon on the left side since last season -- and a commitment to adopting the principles Charron and his staff have preached. "I knew of the skill he had," Charron said. "He was a good skater, could handle himself physically. He had good attributes -- good hands, good shot. It was just a matter of would he be able to put it within a team frame-type of thing. There's a certain way we want our guys to play and can he play in that structure. If he does, perhaps he has the ability to generate that kind of success. That line was put together last year and right from the get-go they generated success because all three of them can skate. They have great skills. They complement each other very well. They're worth the price of admission right now." Lipon said maturity has been a big help for him since joining the Blazers. "I came in as a 16-year-old and everyone knows how that goes," he said. "[Age] 17 was an eye opener because you think you're going to come in and play a bigger part, and it didn't happen that way. When I was 18 [last season], coach gave me the opportunity and I've been running with it." How long he keeps running with his fantastic start is the next question. "Everything's been going in right now, the numbers have been pretty good," he said. "You're going to hit a cool streak, that's how the game goes. Just go with it right now, and when it hits you have to work harder to putting it back in the net." If you ask Charron, that cold streak might not come for Lipon. Maybe not 2.5-points-per-game for 72 games, but the veteran coach said he wouldn't be surprised to see Lipon produce at a high level all season. "I don't see any reason, outside of injuries, for him not to be able to produce at the level he's producing," Charron said. "As all players do, you may run into a dry spell where you're having your chances but they're not going in at the same rate as it's going right now. And as you know, as the year goes on, and even now that line gets a lot of attention from opposing teams. Where he will be given the opportunity to excel is on specialty teams -- he plays both power play and penalty killing. So therefore on the power play he'll have the ability to continue his production. But there's no reason for us to think that he can't continue at the pace he's going right now."